If I hadn’t been told or hadn’t seen something about it on the Internet, I would have totally forgotten it was Earth Day. Earth Day to me doesn’t have much significance. Yeah, it’s great that we plant a bunch of new trees and get into the spirit of trying to make our planet better, but after this day is over, we go back to not caring anymore. I donated a dollar to the Earth Day fund today because I felt like being generous, but I wouldn’t normally donate money to charities because I’m not usually that generous. Earth Day only exists because of a 1970 Wisconsin senators concern about the environment. He got together with a bunch of other like minded people and decided to make this a national day on April 22nd, because apparently that was in connection to a previous “Arbor Day” in 1872 set on the creators birthday. The picture of a long, long country road just a few miles east of me was taken last year. It is a great example of how we pave our way through nature, simply by moving trees to the side, in order to make room for our civilization. 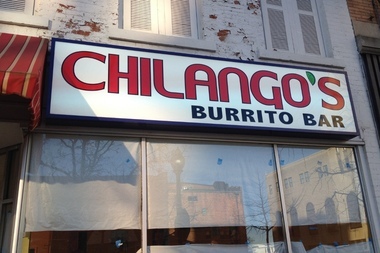 On this glorious Earth Day, I went and ate at a corner restaurant today called Chilango’s. It is an unassuming, rinky dink kind of place that serves a delicious Mexican cuisine, including tacos, burritos, and enchiladas. I ordered two tacos with guacamole sauce on them and I can describe how they tasted in a word I have never used before on this blog – scrumdiddlyumpious. I admire the outside and inside artwork of this little dive even if it calls up something out of a trashy 80s movie. The artwork on the walls is also neat.